2000 off a Subaru Impreza WRX Turbo | What Car? 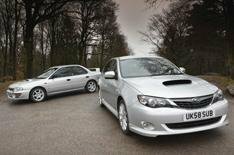 Subaru has knocked more than 2000 off the price of the final Impreza WRX Turbos to be sold in the UK. Powered by a 230bhp 2.5-litre petrol engine, the WRX Turbo is now available for 17,998. That's the same price as the first official UK-spec Impreza turbo, which went on sale in 1994. The car comes with a three-year, 60,000-mile warranty, plus 12-year anti-corrosion cover and a three-year paintwork warranty.